Another magnitude 7.9 earthquake in the San Francisco Bay Area would probably produce much stronger shaking than the catastrophic 1906 event of the same size. The wider region should also expect thousands of fatalities and economic losses in the billions. These conclusions are contained in two reports released to coincide with the 18 April centennial of the great quake that destroyed the city and killed 3,000 people. The studies will be discussed at a special conference this week. Scientists say the next big quake - a magnitude 6.7 or larger - will likely come within 30 years. The first study, When the Big One Strikes Again, was commissioned by conference organisers and provides an estimate range of the death and damage toll for Northern California if an earthquake similar to 1906 hit the region today. The other study, produced by the US Geological Survey (USGS), shows how shaking intensity would change if the San Andreas Fault were to rupture in a different place to 1906. USGS scientists believe they have been able to reproduce the ground motion that occurred 100 years ago fairly accurately, making it a useful model to estimate the damage caused by the next big quake. "These studies allow us to model the shaking and fill in the big gap in the data," said Dr Greg Beroza, a geophysicist at Stanford University who helped create the USGS simulation. "We can apply the results to other large earthquakes." The conference-commissioned report was prepared by Charles Kircher, a private engineering consultant. One of its shaking scenarios suggests that out of the 10 million residents in 19 counties, a 7.9 earthquake could kill 1,800 and seriously injure 8,000 if it hit at night; and kill 3,400 and seriously injure 13,000 if it hit during the day. Total economic losses could reach more than $120bn. "Daytime casualties are typically higher than night-time, when people are in homes that are less susceptible to collapse than commercial buildings," said Dr Kircher. However, the proportion of night-time deaths is raised slightly in San Francisco itself, where older homes are more vulnerable to collapse. Roughly one quarter - 800 - daytime deaths and almost a third of night-time deaths- 574 - would be in SF city districts. 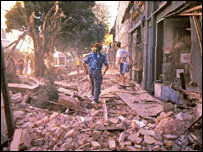 The estimates are based on death by building collapse by shaking alone; not by fire, which could raise the death toll. Of the city's 400,000 residents in 1906, it is estimated that 3,000 died from both building collapse and the conflagration that swept the city immediately afterwards. While it was unlikely a fire that size would rage again, smaller fires were very possible, said Dr Kircher. "We expect fires to contribute significantly to the total loss," he added. Adding in the cost of damage due to fire and lifeline infrastructure - such as highways - could raise the economic bill to $150bn. And this does not include long-term economic impact, the sort experienced in New Orleans after Hurricane Katrina. 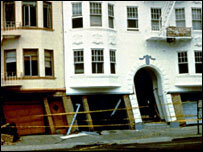 The total is 10 times the loss from the 1989 Loma Prieta Earthquake, a 6.7 tremor on the San Andreas Fault centred in a mountainous region 100km (60 miles) to the south of San Francisco. Dr Kircher's study estimated loss to the area by using two 7.9 shaking scenarios that produced two sets of figures. The second set, referred to as M7.9, is based on a standard model of energy propagation from an earthquake occurring on the segments of the fault that ruptured in 1906; a sort of generic 7.9 quake. Death and damage estimates are lower in the MMI model than in the M7.9; 800 night-time and 1,600 daytime deaths for the region, and $90bn dollars in economic loss. While the population has increased 10 fold since 1906, when less than a million people called the greater San Francisco Bay area home, the number of fatalities does not increase proportionally in the recent estimates. "Our knowledge of earthquakes and how they affect buildings have advanced quite a bit and our seismic codes have been advancing," said Dr Beroza, "but we're still talking about thousands of deaths. Will the public say that's acceptable?" Dr Kircher said that an important finding of the study was that vulnerable buildings - un-reinforced masonry, older reinforced concrete and "soft-storey" - made up less than 5% of all buildings in the region but would kill more than half the people. "Fixing those buildings would cut our casualties in half," said Dr Kircher. The second USGS study to be presented to the conference offers scientists a re-creation of the 1906 shaking, and a how it might change if the fault ruptured other than where it did, 2km off the coast of San Francisco. The computer model draws on a new and highly detailed 3D geologic model of the Bay Area. While scientists do not know when the next big quake will come or where it will originate, they do say that a 7.9 quake is unlikely to mirror 1906. "There is no guarantee that the next big one will begin exactly where the last big one began," said Dr Beroza. "It will be different and may not start in the same place." In the USGS simulations, a rupture at the northern end of the San Andreas Fault, with the same amount of slip, creates the same or greater shaking for San Francisco as it did in 1906; while an epicentre at the southern end of the northern portion of the fault, near San Juan Batista, creates considerably stronger shaking for the city. This is due to variations in local geology and the fact that the energy from the rupture and seismic waves increase as they propagate toward the city. "Things could be worse for San Francisco itself with a rupture that begins south of the city, than it was in 1906 when the rupture began very close to it," said Brad Aagaard, a USGS research geophysicist who ran the simulations. This, ironically, makes the original 1906 quake, with its epicentre near the city, a best-case scenario for San Francisco if a 7.9 earthquake were to hit again. But increased shaking in one area means less shaking somewhere else. Moving the epicentre to San Juan Batista produces more intense shaking for San Francisco, but milder shaking in the Silicon Valley region. "The bottom line is that the next large event on the San Andreas Fault will differ in some ways from the 1906 earthquake," said Dr Aagaard. "We need to consider many scenarios in order to be prepared for such an event." The 100th Anniversary Earthquake Conference continues through to 21 April in San Francisco.